Distinctive contemporary designer suiting. Eco-friendly fabric. Single-breasted styling. Slim fit. 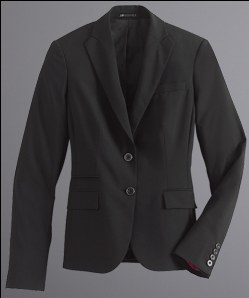 Mock peak notch lapel. Two-button closure. Signature shell buttons framed in stainless steel. Front waist darts. Upper left chest welt pocket. Two lower front angled pockets with flaps for slimming effect. Lower front besom watch pocket. Four-button sleeve vent. Inner key pocket and two inner lower pockets. Center back vent. Jacquard dot patterned lining with contrast piping. Fully lined with fast-drying, breathable AEROCOOL® lining. Dry clean only. Imported.